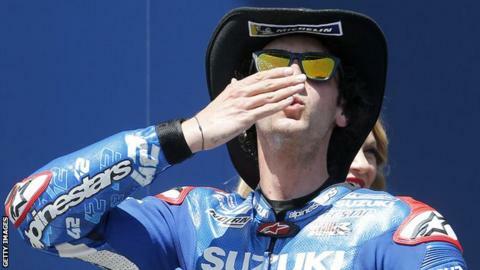 Alex Rins claimed a surprise maiden MotoGP victory at the Grand Prix of the Americas as champion Marc Marquez crashed out. Marquez, aiming for his seventh win in a row in Austin, was leading by almost four seconds when he lost control of his Honda on the ninth lap. The Spaniard was unable to continue and Rins edged out Valentino Rossi to win by 0.462 seconds. Overall championship leader Andrea Dovizioso finished fourth. Australia's Jack Miller was third, but Britain's Cal Crutchlow crashed his LCR Honda on the sixth lap. Italy's Rossi is second in the standings, three points behind leader Dovizioso, and Rins is third with 49 points. "I beat Valentino, this is unbelievable for me. He was my idol when I was very young," Rins, 23, said. The next race is the Spanish Grand Prix on 5 May.